Autopilot, that’s not just what Tris (Woodley) uses when she steals a flying machine from the new villain of the series. It’s also what happens when these teen-based, sci-fi fantasy saga’s make so much money, that the creativity fly’s out the window the exact same time the money pours in. For those who haven’t read the book, the hand-over-mouth conclusion of Insurgent (2015) was enough to make me halfway excited for the third chapter, thank you Naomi Watts. While The Divergent Series follows the “split the last book in half” concept, it still fares better than Hunger Games third part. This series, which boasts immense talent from all the actors, still sacrifices organic filmmaking for oversaturated visual effects. Following Jeanine’s assassination, Evelyn (Watts) has now taken control of Chicago. Her rebellion shuts down the outer walls, prohibiting anyone from entering the city, citizens recently learned was nothing more than an experiment. Four (Theo) worries that the city, under the control of his estranged mother, could end up being worse than the previous dictator. Tris and her closest friends, even her traitor brother (Elgort) flee the city, over the walls, chased by Evelyn’s men, to discover the advanced civilization known as The Bureau of Genetic Welfare. 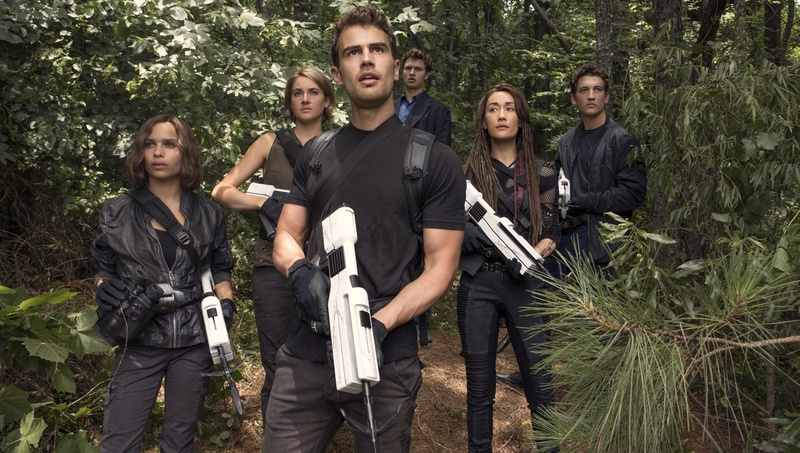 Tris is labeled a miracle and a perfect specimen, in which they hope to replicate and heal the “damaged”. The script fails to remind us why we care about these characters in the first place and just focuses on futuristic buildings, machines and action sequences. At no point does Allegiant feel like half of a book, it certainly has its own stand- alone plot with a begging and end (albeit it not a cliffhanger like the previous). Yet the franchise seems to lose enthusiasm as our heroes discover new cities and redefine old ones. Ashley Judd (dead ole mom) makes her obligated appearance to once again shed light on the past. The group of heroes stumble into what looks like The Martian or Mad Max territory with red running water and bleeding clouds. It’s the odd magic flying condoms that really take the series visual effects to a new low. The original film relied more heavily on emotions and the yearning Woodley (The Fault of Our Stars) portrays so well. Here she is relegated to an equal supporting character. Despite a predictable character death you can spot miles away, Allegant has no pulse. It moves characters from one place to another while wild eyed Weston (Chasing Mavericks) steps in as the defacto bad guy as another worse villain emerge. “Help me save the world”, one of the characters says, but haven’t we done that already? Allegiant seems to be building towards the same inevitable conclusion (and consequent hype) that will be weakened by the time the final film rolls around. Robert Schwentke (Insurgent) doesn’t seem to have the creativity to make this franchise better than any of the others. The script fails to remind us why we care about these characters in the first place and just focuses on futuristic buildings, machines and action sequences. Prioritizes visual effects and green screen over all the talented actors at their disposal.